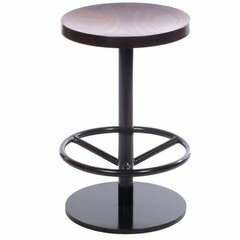 Phloem Studio Harbor stool is a modern contemporary solid walnut wood counter high stool handmade custom to order with turned tapered and shaped legs and tube backrest shaped from hardwood by hand. Available with a rope woven seat (shown here) or upholstered seat. The sturdy, but graceful footrest has an exposed tenon from the cross brace displayed on the spindle. Each seat has 140 feet of polypropylene rope with a modern yacht weave. Similar to rope used in sail line, it is very comfortable and soft and tactile to touch. Designed by Benjamin Klebba and his father Ron Klebba. Measure: Counter height seat is 26" from the floor. Custom heights are available. Also available in bar heights. Harbor Stool wood frame available in white oak, walnut, or black. Rope is available in black, gray, navy, or tan. Custom heights are available -- please get in touch. PHLOEM STUDIO is a small furniture design studio based in the Pacific Northwest, founded by designer/craftsperson Benjamin Klebba. PHLOEM creates timeless modern furniture with an emphasis on natural materials, traditional joinery, and graceful proportions. Benjamin grew up in the Great Lake state of Michigan in the woods across the street from Lake Huron. His father built the house he grew up in, the furniture inside it and sailboats their family would sail on Lake Huron. This left a lasting impression. After college, Ben moved to Chicago, first apprenticing for a luthier building acoustic guitars, then working for a furniture maker. Eventually moving to Portland, OR, PHLOEM STUDIO was formed. Now based in the Columbia River Gorge, a national scenic area about 45 minutes outside of Portland, Ben’s dad Ron now works for PHLOEM STUDIO. Working with his father and a small team of craftspeople and collaborators, each piece of furniture is built custom to order. PHLOEM STUDIO has been featured in the Wall Street Journal, the New York Times, Dwell, New York Magazine, Monocle and others. PHLOEM has debuted new designs at the International Contemporary Furniture Fair, West Edge, and the American Craft Council Show. Select clients include Dropbox, Nike, HBO, and AirBnb. A custom counter stool with a turned walnut seat on a patinated steel base. A steel chromed five-legged stool. Swivel seat in a solid varnished beech seat.